Synthetic peptide within Human Tbx6 aa 150-180 (C terminal) conjugated to Keyhole Limpet Haemocyanin (KLH). The exact sequence is proprietary. K562 cells and cell lysate. Our Abpromise guarantee covers the use of ab170482 in the following tested applications. WB 1/50 - 1/100. Predicted molecular weight: 47 kDa. Probable transcriptional regulator involved in developmental processes. Could be required for specification of paraxial mesoderm structures during gastrulation. Expressed in fetal tail bud, posterior spinal tissue, intervertebral disk and testis. Also expressed in adult testis, kidney, lung, muscle and thymus. Expressed during gastrulation and during a second phase in some adult tissues. 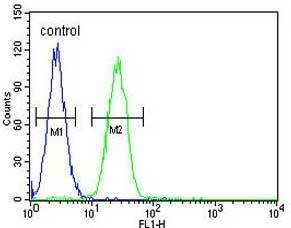 Flow cytometric analysis of K562 cells (right/green histogram) compared to a negative control cell (left/blue histogram) labeling Tbx6 with ab170482 at 1/10 dilution. FITC-conjugated goat-anti-rabbit secondary antibodies were used for the analysis. ab170482 has not yet been referenced specifically in any publications. Publishing research using ab170482? Please let us know so that we can cite the reference in this datasheet. There are currently no Customer reviews or Questions for ab170482.